A compilation which includes some of the most important works of the this great guitarrist. In addition to the well-known rumba after which it's named, the album includes Zorongo gitano, Monasterio de sal, Punta Umbría, Guajiras de Lucía and others. El Lebrijano in a special colaboration with Paco de Lucía this is Arte Puro, inspired the inovative and the traditional. El Lebrijano is the best display of the Peña de Lebrija family. Cantaor jondo, yet innovative, he has been succesful with the fusions he has made with arabic music. 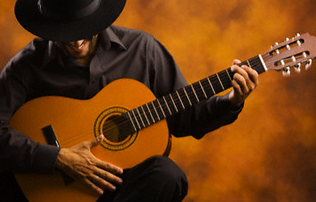 Paco de Lucía's solo recordings culminates its first period with Almoraina. It is a period dedicated to the creation of an original langauge. This 1991 album shows Paco de Lucía along with the Cadaqués orchestra in the famous Concierto de Aranjuez of the maestro Rodrigo. It also includes songs from Iberia by Isaac Albéniz. El Duende Flamenco de Paco de Lucia 1972 is brought to us mostly with guitar along and with few orquestra accompaniments and Paco's 'brother,' Ramon de Algeciras. Brilliant sound and technique by one of the greatest guitar players in the world. Zapateado, Rondeña, Tientos, Guajiras and other songs. Camarón Recopilatorio consists of three discs: 'Al verte las flores lloran' 1969. 'Cada vez que nos miramos' 1970 . 'Son tus ojos dos estrellas' 1973.